I am a full time working employee and a part-time blogger (Since some of the guys work with us full time also for my other websites, but being as a blogger I am sharing this). 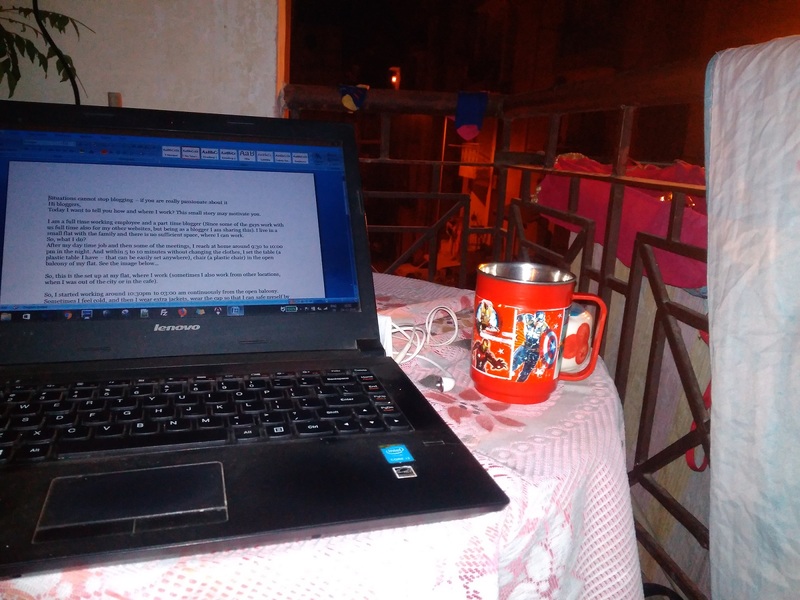 I live in a small flat with the family and there is no sufficient space, where I can work. So, this is the set up at my flat, where I work (sometimes I also work from other locations, when I was out of the city or in the cafe). 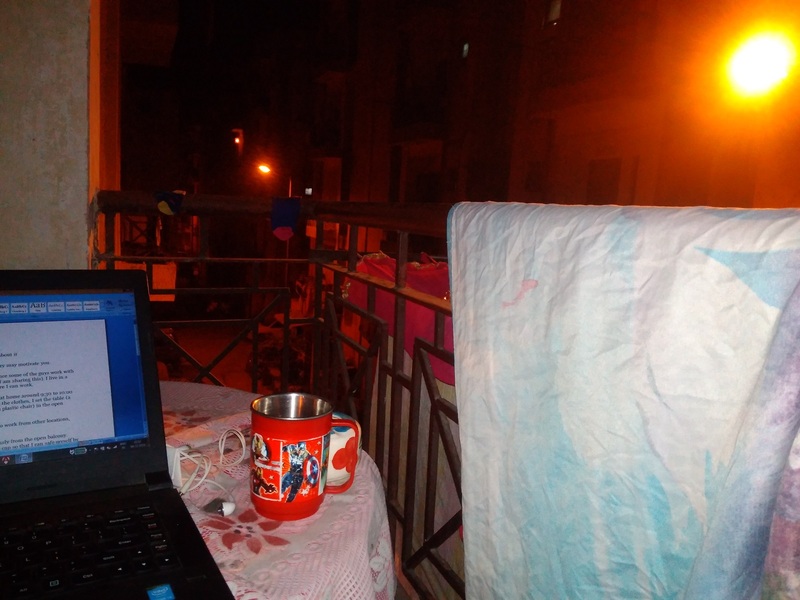 So, I started working around 10:30 pm to 03:00 am continuously from the open balcony. Sometimes I feel cold, and then I wear extra jackets, wear the cap so that I can save myself by the air and the cold. Sometimes temperature below the 10 degree Celsius. 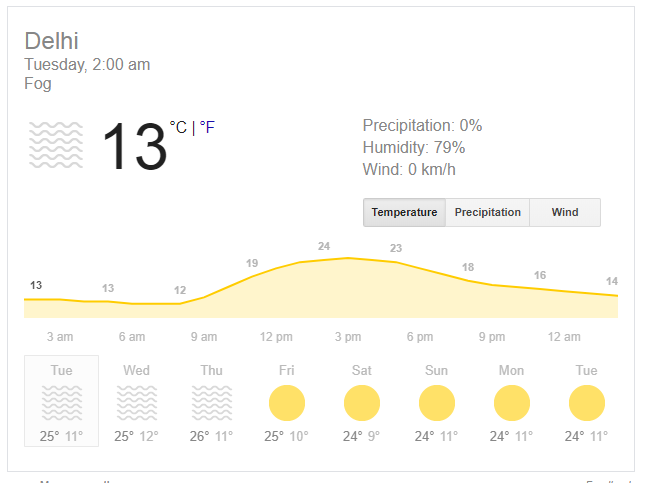 See the current temperature (below image), its 13 degree Celsius. After finishing my regular work from here, I shut down the laptop, pack my bag for the next day office and go to sleep (with the same clothes) and again in the morning, get ready within 5 to 10 minutes and go for the office. There are many things (please don’t judge me as a lazy person, I just try to save my time and invest saved time in the blogging) – which I am missing, like no regular bath, no regular cloth change. I always wear chappals so that it can be easy to do anything like go to the washroom, go to the bed, go the office (it may disgusting for someone – but I am loving it because I want to keep myself very busy). Whatever, I wrote is 100% true and I don’t want to say that I am a very great person. I am just a normal blogger, who is passionate about blogging. I think I am made for it. In the end, I want to say – if you really want to become a good blogger – you must be passionate about it and you must have to leave your luxurious life. This post motivated me a lot. A grand salute to you. Thanks ABHISHEK that you liked the post. You are also a hardworking and passionate blogger. Thanks, you must start. If you think anything, you will achieve. Try to do work hard and genuinely. All the best ! when you feel any issue, may contact me. Much inspired by your story sir 😀 It is fascinating to see that busy person always manage to steal time for what they are passionate about. My routine is quite different, I sleep at 10:15 PM and wake up at 3:35 AM, freshen up and go for an 8.5km walk (1-mile run included). I usually return by 5:45 AM, study something on Unacademy till 7. Then I go to sleep from 7 to 8:30 AM and follow the usual routine for the rest of the day. That’s good, you managed the time properly – when you work for your website? Usually between 10 AM -12 PM and 3 PM to 6 PM 😀 Whenever I get bored. Really a motivating post thanks for this ………….you will definitely be a great doctor in your field the BHMS best of luck sis…….